Over the weekend of February 2nd and 3rd, ten student-athletes from King’s-Edgehill competed in Sackville High School’s annual wrestling tournament on Saturday and the Nova Scotia Opens on Sunday. Between the juniors and seniors and the boys and girls on the team, they competed in nearly 50 matches and brought home 14 medals, including 5 GOLDS – three at the high school tournament and two at the open tournament. Both days were long, but our wrestlers’ spirits were high as they continued gaining experience, trying new moves, and competing against different opponents from outside the province. Our team members included those with very little wrestling background, such as Anna Emery, Aimee Cooper, David McCurdy, and Raya Rhein. All four of these competitors lost more than a few matches between them, but they stayed positive and what they gained in experience will pay off in the long run. Evan Logan had some bad luck and dislocated his elbow in his first match, but his excellent fitness will make for a quick recovery in time for the rugby season. Our School athletic therapist, Jennie Weisner, deserves a special thank you for the excellent care she provided Evan. Our remaining boys, Callum Lovelace, Quinn Emery, and Greg Otto finished 1st, 2nd, and 3rd in their respective divisions on Saturday. Greg wrestled his first-ever match on Saturday and continues the proud Otto wrestling tradition. Bella Turner-Galaise finished first and second on Saturday and Sunday, after having wrestled very technical matches. With continued effort, she may provide the bedrock for the future senior team. Voted MVP of the tournament on Saturday by the other coaches, Tea Racozzi dominated the 73 kg division. Just as importantly, she provided, as always, an excellent example to the rest of the team for how a King’s-Edgehill athlete should conduct herself on and off the mat. A very special thank you goes to Olivia Drava, who travelled with us both days to work as a mat official. The young men and women of our team are now looking forward to the next big event of the season at Riverside Educational Centre, where they will compete at Atlantics. 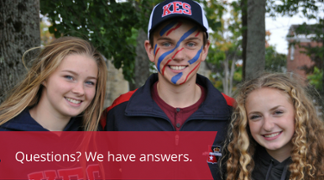 Looking for answers about private school? Download our latest ebook, 'Questions to Ask' when considering Private school. It’s full of helpful information as you consider our School.